My great-aunt, one Bertha Curliss Goshey, died this March. I hadn't seen her in many years, but have fond memories of her husband's glass bottle collection (many made in their hometown of Millville, NJ), my aunt's quilting talents, her mesmerizing assortment of thread spools, the warm black heater grate in the middle of their living room floor, and the incessant, loving bickering in which she and my Mommom engaged. 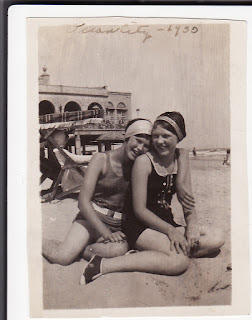 Above is a picture of the two of them, which Mommom labeled "Hannah and her kid sister - 1930." Bertha's on the left and Hannah's on the right. 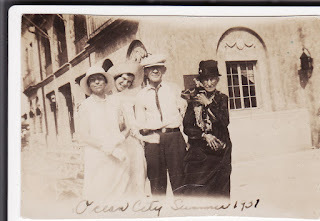 They are together in front of the Ocean City Music Pier, which looks just like it does today. The second picture is labeled 1931 and is of my great-grandmother (Nan), two of her three children (my Aunt Bert and Uncle Dave), and my great-great grandmother. I have no idea what she's holding. I am fascinated by this woman. Click on a photo for an enlarged (and fairly high-resolution) version.